Dozens of Red Riding Hoods are apple picking in the woods! 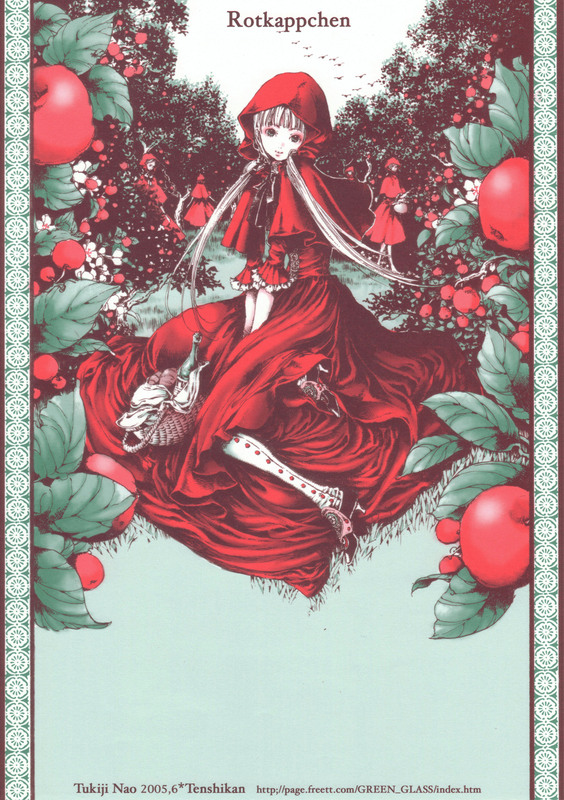 Another deliciously Victorian inspired design, with another rendition of Little Red Riding Hood. It looks so interesting! Wow! The artstyle remembers ad-like art, some kind of technique that few people use nowadays! Green, red and black are a lovely combo! I really enjoyed this! Thanks for sharing! very nice scan! XD i expected green glass to turn red riding hood into an evil lil girl ^^; .. guess i'm too into that type of art...anyway, thx for sharin it! so beautiful. what a gorgous representation of such a classic and well-loved story. it makes me nostalgic. The color scheme of the dress and the border work so well together to hold the eye captivated. Thats a very interesting scan, an absolute favorite of mine. Interesting... there's several more Little Red Riding Hoods in the background.... Very captivating image indeed! Thanks for sharing! owwww.... can anyone tell me how to draw it? Wonderful scan. Thanks for sharing.